Russian Science Grammar presents the fundamental differences between the parts of speech in Russian and English. 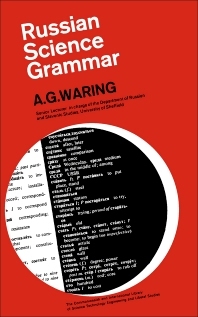 This book discusses the function of words in Russian, which is shown by changes in the endings of the words themselves. Organized into 10 chapters, this book begins with an overview of the distinct features of the Russian sound system. This text then explains that stress varies not only from word to word, but often between various forms of the same word where it changes in declension or conjugation. Other chapters consider the grammatical division of clauses into noun, adverbial, and adjectival. This book discusses as well classification of clauses designed to facilitate recognition and translation. The final chapter deals with understanding complex sentences, particularly in scientific Russian where they are often very involved. This book is a valuable resource for students who are interested in understanding the Russian alphabet and science grammar.